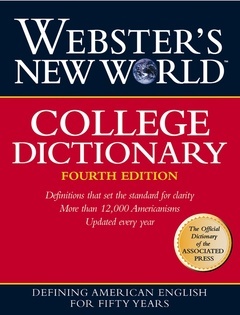 Selected by the Associated Press, The Wall Street Journal, The New York Times, and other leading newspapers as their official dictionary of choice. Nearly 7,500 new entries bring meaning and understanding to changes in lifestyles, technology, medicine, society, world politics and cultures, and more. Important people, places, objects, and concepts are clearly illustrated to help you recognize and identify them. Numerous tables, charts, and lists provide a handy reference to geographical and other useful data. Special sections also include important historical documents, a guide to punctuation, and full color maps of the world. The people and places that shape our worldview are fully covered. Entries are part of the A Z body of the dictionary, so they are easy to find. Many entries include maps or photographs. To help you choose words precisely, usage notes give important cautions and explanations. Examples put words into meaningful context. Synonym notes list related words and distinguish among their meanings. Each page is designed so you don't have to work to find the information you want. Webster's New World College Dictionary includes more unique Americanisms - more than 12,000 - than any other college dictionary. Its crisp, dynamic defining style is itself uniquely American. Dictionaries of English (Sidney I. Landau). U.S. Metropolitan Core Areas by Population. Cities of Canada by Population. Oceans and Seas of the World by Size. Largest Lakes of the World. Longest Rivers of the World. Hoghest Mountains of the World. Commonly Used Weights and Measures. Alphabetical List of the Chemical Elements. Richter Scale for the Comparative Magnitude of Earthquakes. Modified Mercalli Scale for Earthquake Destructiveness. Amendments to the Constitution of the United States.